“I expressed to the president the absolute necessity…to immediately suspend Schengen to be able to control our borders as an essential element in the fight against terrorism, and also the fight against arms trafficking,” Le Pen told reporters following a meeting with Hollande on Friday. The Schengen Area consists of 26 European countries that have abolished passport and any other type of border controls. The agreement allows for both freedom of movement for both European citizens, Schengen visa holders and those who can travel in the area visa-free. Freedom of movement is considered “a fundamental right” guaranteed by the EU to its citizens. Four EU states however – Bulgaria, Croatia, Cyprus and Romania – are yet to join the area despite being obliged to do so, sometimes due to resistance from other EU states. Le Pen also turned her eye to the issue of dual-nationals who have been suspected of engaging in terror-related activities at home or abroad, saying such individuals should be stripped of their French citizenship. “I also expressed the necessity – in another inevitable way – of measures for the removal or the forfeiture of citizenship for all of those who have dual citizenship who have left to train or fight in a foreign country, and then come back to our territory, to commit barbaric crimes, which seems to be the case with these two murderers who are currently in the process of being chased,” she said. The measure would put France in line with the United Kingdom, where Home Secretary Theresa May currently has the power to strip foreign born terror suspects of their British citizenship if they possess another citizenship. Hollande has yet to react to Le Pen’s proposals. Le Pen made waves on Thursday by expressing her support for the death penalty, saying she would organize a referendum to reintroduce it if elected president in 2017. Following Wednesday's deadly attack on the office of satirical weekly Charlie Hebdo in Paris, Le Pen made a passionate speech against Islamic fundamentalism, which she called an "odious ideology." Critics have accused Le Pen of ratcheting up anti-immigrant and anti-Muslim sentiments for political purposes. France is home to Europe’s largest Muslim population, with nearly five million people practicing Islam out of a population of roughly 65 million. 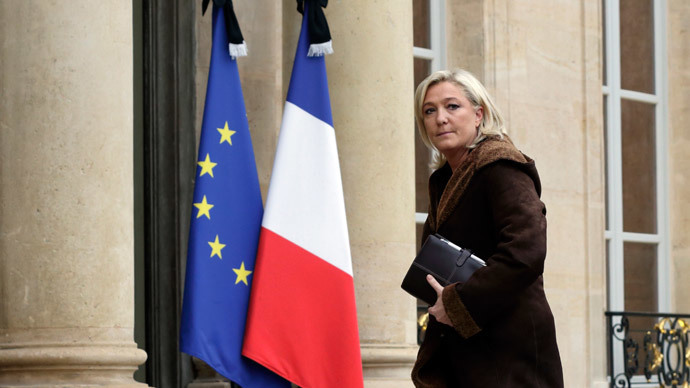 As the president of FN, Le Pen has vowed to drastically curb immigration if elected president. According to the latest opinion polls, if France were to hold its presidential election today, Le Pen would lead in the first round. The French presidential election is set to be held in April and May 2017.